War hero. Friend to presidents, generals and grunts alike. Pioneer in his field, respected by military and academic institutions, visited by millions of people a year, subject of a variety of internet-fueled legends and soon to be the subject of a major motion picture. Not bad for a dog. Especially one that's been dead for more than 90 years. The story of Stubby, commonly referred to as Sgt. Stubby, is one of great service, trust and loyalty. It began in Connecticut, crossed the Atlantic into the battles of World War I, and returned home to a hero's welcome. After a lifetime of honors at the side of his owner, James Robert Conroy, Stubby died in 1926, received a 15-paragraph obituary in the New York Times, and would eventually become part of the Smithsonian's collection — his coat, laid over a cast, is on display at the National Museum of American History. However, the details that make up the stuff of legend — the animated "Sgt. Stubby: An American Hero," is set to hit theaters in April — are a bit hazy. Chief among them: The dog's rank. "I'm quite convinced that he was promoted by the internet," said Ann Bausum, who has written two books about Stubby. "It sounds so good, we want it to be true … and one of these reasons I think this isn't true is that there is not a single contemporary story from his lifetime, and I looked at hundreds of newspaper articles of Stubby, there is not a single one that calls him 'Sgt. Stubby.'" Part of the confusion may come from Stubby's vest, which includes a patch with three chevrons. While they may represent a sergeant's rank today, they were used in World War I to identify soldiers — and, apparently, dogs — with overseas service. "He was just 'Stubby,'" Bausum said. "And that was good enough for him." Stubby was no ordinary stray dog, but that's how he started out: One day he happened to show up at Yale University in New Haven, Connecticut, where soldiers were training prior to deploying for France during World War I. He came in with his stubby little tail and won the hearts of the men training there — he was taken along for the deployment, though the exact details on how Stubby made it to France aren't certain. It's said that then-Pvt. Conroy stowed him away on the soldiers' ship, and when found, Stubby saluted the commander. That gesture earned him passage for the rest of the journey. In France, Stubby was said to have saved the entire division by finding and detaining a German spy. His New York Times obituary breathlessly relays the tale, saying the dog "stole out of the trenches and recognized — a German." "Attempts by the German to deceive the dog were futile," the obituary notes. It's also said Stubby learned when bombs where inbound and would warn the soldiers prior to the explosion. So, if even some of the legend is true, was Stubby a so-called "war dog," or a precursor to the modern military working dog, or a mascot? "My grandfather was always clear: He was a service dog," said Curt Deane, Conroy's grandson. "He gave the troops comfort, he gave them support. He used to run through the trenches and warn them about gas attacks. He used to go outside of the trenches and into this sort of no-man's land, between the U.S. and the German trenches, and stand by soldiers who had been injured until the medics could come and get them." All those heroics didn't necessarily make Stubby a model soldier. One of the most frequent questions asked by Conroy and his fellow soldiers with 102nd Infantry Regiment, 26th Infantry Division, was, "Where's Stubby?" "Stubby would disappear for weeks at a time," Deane said, "and the guys would kind of have no idea where he was, and there was this whole fear that he had been killed or whatever. And my grandfather would say, 'He always came back with his head held high and his stubby tail up in the air' and knew right where my grandfather was. "It was amazing. And these troops wouldn't stay still — they were moving around, but he always came right back and knew exactly where my grandfather was." The dog even, somehow, returned to Conroy's unit after he'd been "adopted" by French soldiers, Bausum said. Like many Stubby tales, details are thin, but he was back with the 102nd in time to return to the U.S., where he continued his service to the troops. "There were these massive conventions at various cities, annual conventions around the country, and Stubby would go to those and he would be revered," Bausum said. "He would march in the parades, he would make newspaper headlines." He was "known to three presidents," according to his New York Times obituary. He had his picture taken with Gen. John "Blackjack" Pershing, the highest-ranking service member since George Washington. He was an official mascot for Georgetown University (where Conroy studied law) and an honorary member of the American Red Cross, the American Legion and the YMCA — which gave him a place to sleep and up to three bones a day. Why did his story catch on? Bausum said she sees Stubby as a product of his time. "The backdrop for it was this horrendous, horrendous war, just the volume of destruction was just so unfathomable, just sending people out in cloth uniforms against machine gun fire, just the waste, makes it a very dark war," she said. "And yet there was this story that ran through it that had so much hope in it." Stubby didn't escape unscathed. He was wounded and gassed, according to the New York Times obituary. Army Gen. John J. Pershing decorates Stubby during an award ceremony. Stubby died in Conroy’s arms March 16, 1926. The dog’s loyalty and tenacity have earned praise for more than a century, and have also led to some disagreement among dog lovers about Stubby’s breed, which has never been known. "I've come to view him as sort of like a Rorschach blot, where people look at these blots of ink and individuals can see all different manners of things in the shape, and they sort of see what they want to see," Bausum said. "If you love boxers, he's a boxer. Or if you're a pit bull fan, he's a pit bull. … When you say that he's a Boston terrier, people say, 'Well he sure doesn't look like a Boston Terrier,' but he did look like what was then a Boston terrier." "Sgt. 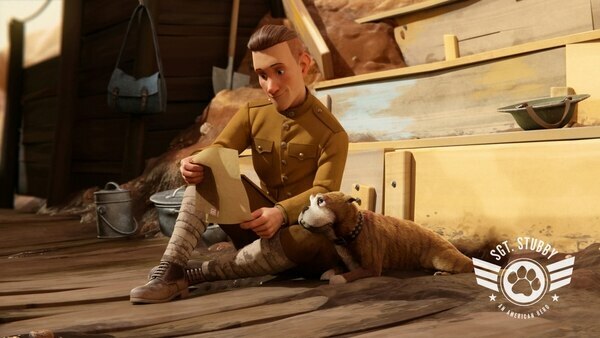 Stubby: An American Hero," is set for an April 13 release. Among those lending their voices to the Hollywood-ized tale of Conroy and his dog are Helena Bonham Carter, who'll play Conroy's sister, and Gérard Depardieu, set to portray Gaston Baptiste, "a battle-tested mentor to Sgt. Stubby," according to a news release from Fun Academy Motion Pictures Studio. As the film approaches, Deane said plans are underway to commemorate Stubby's life, and the bond he shared with his owner, in other ways. Talks are underway with the American Red Cross to allow sales of a plush Stubby doll to benefit the nonprofit's program that sends dogs to visit soldiers at Walter Reed National Military Medical Center Bethesda, Maryland. "Sgt. Stubby: An American Hero" is set to debut in theaters in the spring of 2018. "Stubby, originally after he died, spent a lot of time in the lobby of the American Red Cross in Washington," Deane said, "so the thought is to have a statue of Stubby at the American Red Cross because he was a permanent member." As his grandfather told stories about Stubby, it became clear to Deane that Conroy never quite let go of his heroic dog. Deane promised his grandfather that he "would do everything possible to keep Stubby's memory alive." "I used to always ask him why he never got another dog," Deane said of his grandfather, "and he made it very clear to me that Stubby was so special and so unique that he just couldn't imagine another dog being able to fill that role."